This corals is an LPS coral with large polyps over a hard skeletal base. They prefer low to moderate lighting even though they use photosynthesis, and also prefer low to moderate water flow. Adding corals like this adds placement variety to our tank since so many of our other corals prefer to be higher in the tank due to the lighting requirement. The neon centers of this coral really pop with the lunar lighting! This coral is very cool! It is called a toadstool because of how it looks when the polyps are retracted, very mushroom-like. It requires medium flow and lighting as it uses photosynthesis for growth but can also be feed supplementally. I have read that these corals can release a toxic slime against other types of corals, so we will see how it interacts and affects the others in our tank. 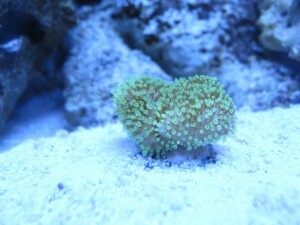 It is also common for these corals to shed a film to rid itself of debris and algae. These toadstools can get as big as three feet, but can easily be cut down if out of control. I am very excited to see this coral grow. This coral is a soft coral and is also know as “Pulsating Xenia” because it pulses its polyps, creating a constant pumping motion. This looks very bizarre when there is no flow in the tank and yet this coral still writhes and pulses, reminding me of pile of snakes. 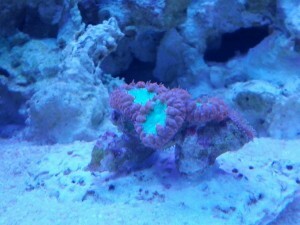 I have nicknamed it Medusa, and although it is not a flashy coral by any means, it is my favorite. This coral is typically considered a “weed” because most aquarists say it grows as such, yet there are some that can’t seem to grow it at all. We will see how it fairs in our tank, but I hope it does well. This corals prefers moderate to high lighting because it uses photosynthesis for growth, moderate to high water flow, and will spread on any nearby surfaces especially toward the flow of water that is strong enough to bend their stalks.